An honest Wood Elf in Bruma has upset some dishonest people. "Loosen the fastenings any night between 8:00 pm and 11:00 pm..."
Receive your next contract from Vicente Valtieri. Travel to Baenlin's house in Bruma. (Optional) Release the mounted Minotaur head. Return to Vicente to collect your reward. Once you accept the contract, Vicente will tell you what needs to be done: "As I expected. Good. The target is a Wood Elf named Baenlin. You will find him at his home in Bruma. Enter secretly and avoid his manservant, Gromm. On the second floor is a secreted door leading to a crawlspace. Inside are the fastenings of a mounted head that hangs over Baenlin's favorite chair. Loosen the fastenings any night between 8:00 pm and 11:00 pm, and the head will surely fall on Baenlin as he relaxes in his chair, as is custom. If Baenlin is killed in any other manner, or if the manservant Gromm is killed, you will forfeit the bonus. Now go, and may Sithis be with you." You are now directed to go to Bruma and kill the target Baenlin in his own home. If you speak to Gogron or Teinaava before you leave, they will also provide an insight on his manservant, Gromm: "The manservant's name is Gromm, you say? Sounds like a Nord. Probably a big one. If he catches you, get ready for a serious fight." and "If the target is old and weak, as you say, then his manservant is sure to be quite the opposite. Best to stay out of his way." "...and the head will surely fall on Baenlin as he relaxes in his chair, as is custom." When you arrive in Bruma, Baenlin's house is located just north of the eastern gate. If you spoke to Antoinetta beforehand, she'll give you some advice about how to enter the house: "How do you plan on entering this man's house? Through the front door? Be smart and look for a more inconspicuous way in, like a cellar entrance." Following her suggestion, you can find a door leading into the basement situated at the rear of the house, providing a safe and indirect access. Once inside the house, sneak upstairs, enter the room closest to the stairs, and proceed into the crawlspace through the door hidden in the wall. Remember Vicente's directions: "Loosen the fastenings any night between 8:00 pm and 11:00 pm, and the head will surely fall on Baenlin as he relaxes in his chair, as is custom." Wait until it is between those times before you release the mounted head. Once you're in position, loosen the planks and the head will then crash to the floor, killing Baenlin instantly. Sneaking out the same way you came, you will notice Gromm standing in front of Baenlin's dead body. Be careful not to attract his attention as he will now attack you on sight. Retreat through the basement and out into Bruma, then return to the Dark Brotherhood Sanctuary. Valtieri will comment on your completion of the contract. If you killed Baenlin in the manner requested, he will say: "So, the accident has been staged, and Baenlin lies dead. Well done! You have more than earned your reward and bonus." However, if you completed the mission in some other way, he will be disappointed: "Baenlin is dead, yes, but you did not fulfill the contract precisely as directed. I will grant your reward of gold, but the bonus is forfeit." He will then reward you with a leveled amount of gold (up to 600 gold) and an advancement to Slayer. If you successfully made Baenlin's death seem like an accident, you will receive the bonus reward Sufferthorn. You can now accept the next quest from Vicente, and the quest Scheduled for Execution will begin. An achievement will be unlocked upon being promoted to Slayer. Make sure Baenlin doesn't see you, as he will leave the chair. You will then have to leave, wait, and try again. Baenlin will actually stay in his chair until midnight. If you have already killed Gromm, you cannot get the bonus. If Gromm sees you, he gives you twenty seconds to leave. If you do not leave (or if he sees you again) he will attack you. The crawlspace cannot be entered before this quest is started. It is possible to wait in the crawlspace if you close the door behind you. The game will no longer consider you a trespasser. Using Detect Life allows you to keep track of where Gromm and Baenlin are, and makes it easier to reach the crawlspace undetected. After you complete this quest, a special edition of The Black Horse Courier, Tragic Accident! Baenlin Dead!, is published. If Gromm survives, you can get a copy from male Nords and Imperials in Bruma; if he died, they won't give you a copy but the Couriers will. If you break into the upper level of the Black Horse Courier building, even before you kill Baenlin, there will be a copy of this edition of the paper. 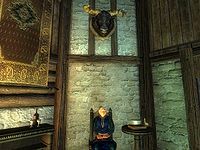 If you return to Bruma on a later date, and if Gromm survives, you can find him in Olav's Tap and Tack, weeping over his dead employer. Baenlin's house is now occupied by his nephew Caenlin. After the quest is completed, you obtain ownership of all of the items in Baenlin's, now Caenlin's, house. Caenlin will still confront you if you take an item, but you will receive no bounty. 10 I must accept a quest from Vicente Valtieri. 100 Finishes quest I have accepted a quest from Vicente Valtieri. 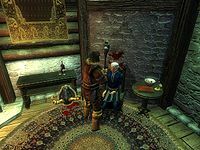 10 I must go to the city of Bruma, find Baenlin's house, and gain entrance. Once inside, I should stage a tragic accident. 15 I have entered Baenlin's house. If I can access the second floor crawlspace and loosen the fastenings on the mounted head, between 8:00 PM and 11:00 PM, it will fall on Baenlin as he rests in his chair. If Baenlin dies any other way, or if Gromm is killed, I will lose my bonus. 20 The mounted head has fallen on Baenlin, killing him as expected. I must return to the Sanctuary and speak with Vicente Valtieri to receive my reward. 30 I fulfilled the contract, but not in the manner requested. As a result, I have forfeited my bonus. I must now return to the Sanctuary and speak with Vicente Valtieri to receive my reward. It is possible to use the console to advance through the quest by entering setstage Dark03Accidents stage, where stage is the number of the stage you wish to complete. It is not possible to un-complete (i.e. go back) quest stages. See SetStage for more information. Esta página foi modificada pela última vez à(s) 01h55min de 16 de dezembro de 2014.